Every year Tres and I take a trip to Destin with friends. Because we all stay on the same condo, one night becomes a big cook-fest. I plan a menu of fresh gulf fish paired with delicious produce and have some girlfriends come over to help me cook. This year I made this snapper, and it was a huge hit! 1. Heat oven to 400 degrees. Place each snapper filet on a large piece of aluminum foil. Season both sides with salt and pepper. Fold the sides of the foil up to make a shallow bowl around each filet. Place on a baking sheet. 2. 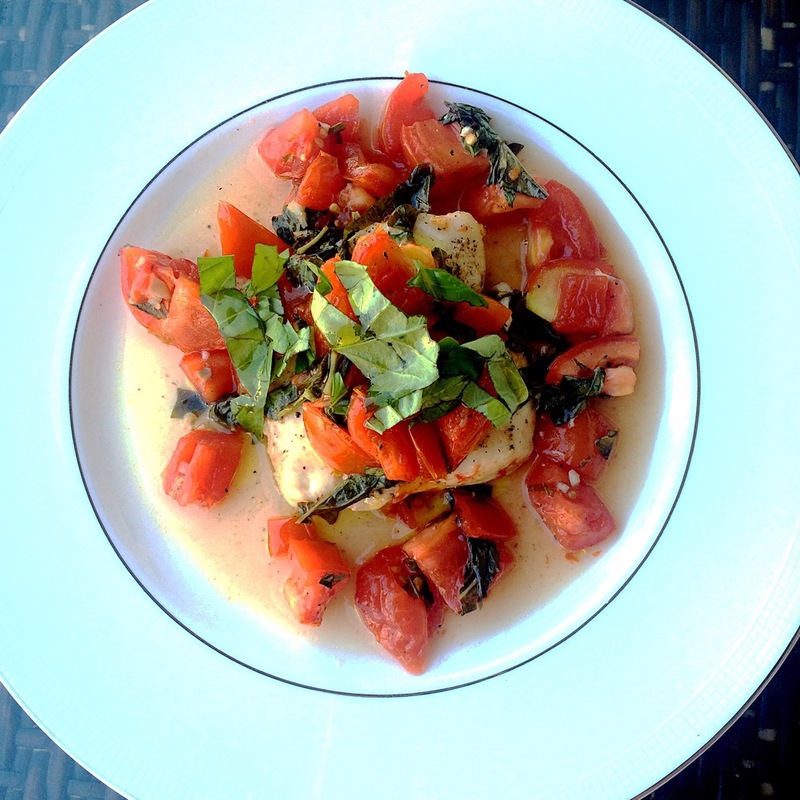 In a large bowl, combine the tomatoes, basil, balsamic reduction, garlic, red pepper flake, 1 tsp salt, and ½ tsp pepper. Mix together, taste, and add extra salt and pepper if needed. Spoon the tomato mixture over each filet, completely covering the fish. Add about 2 tbsp of white wine and drizzle 1 tbsp extra virgin olive oil to each filet. Fold the sides of the foil up to close, making a package but leaving a small opening in the top. 3. Roast fish for 15-20 minutes or until cooked through. Serve each filet on a plate with the tomato mixture and juices on top. Top each piece with extra basil and a drizzle of olive oil.